Daniel Callandrillo was born February 2, 1959 in North Bergen. Dan was the youngest of 13 children born to two deaf parents. The Callandrillos lived in a 3-bedroom apartment. Dan was enormous for his age, both vertically and horizontally. He stayed active by playing basketball—indoors, outdoors, wherever there was a hoop. By the time he entered North Bergen High in 1973, he was a rock-solid 6’2” 160-pound guard. Dan was an unstoppable scorer and solid defender for the Bruins. He started all four years, and each year led the team to a North Hudson championship. The Bruins also won two county titles. As a senior in 1977, he averaged 32 points a game and led North Bergen to a state title. In the semifinals, he had an epic game against Kelly Tripucka and Bloomfield High. Earlier in the season, Dan had a 62-point game against St. Joseph’s. He ended his senior year with 853 points, breaking the Hudson County prep record set in the 1950s by Tommy Heinsohn. He was recognized as a high school All-American. Dan was recruited by several schools, most notably by Al McGuire of Marquette, whose team was on its way to a national championship. Dan ultimately decided to stay close to home. He met coach Bill Raftery while tending bar at a party (the drinking age was 18 back then) and decided to go to Seton Hall. He shared the backcourt with high-scoring Nick Galis in 1978–79, and led the team in assists. Dan led the Pirates in scoring and assists in each of his final three seasons. He was Second-Team All-Big East as a sophomore and junior, and First-Team as a senior—when he was named Big East Player of the Year despite Seton Hall’s unimpressive 11–16 record. Dan finished his varsity career 15 points shy of 2,000 and set a school record with 260 steals, which stood until Fuquan Edwin broke it in 2014. Dan’s 27.4 points per game in 1981–82 established a conference record that lasted until Troy Bell averaged 27.8 for Boston College in 2002–03. Dan was drafted by the Houston Rockets in 1982 but did not make the team. 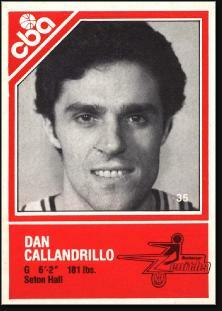 In the summer of 1983, Dan signed a contract with the Nets, but did not even make it to training camp. He was released after a month. He then signed with the Rochester Zeniths of the Continental Basketball Association and played for a year, ranking among the league’s top scorers. He played one year in England in the mid-1980s and was regarded as the best all-around player in the British Basketball League. Dan also played pro ball in Italy. After hanging up his sneakers, Dan got into the financial services business, working in the bond division of Garban-Intercapital. A fear of heights kept him from taking a job with Cantor Fitzgerald at the World Trade Center and, in 2001, when given a choice between working on the 55th floor of the WTC and commuting from Rumson to Greenwich, CT, he picked the long commute. It saved his life; all of his co-workers were killed in the 9/11 terror attack. A few years later, Dan resigned and started his own firm. He also returned to basketball, coaching at the Holy Cross school in Rumson. His son, Danny, was a standout high school player in Leonardo and later as a walk-on for Bryant University.